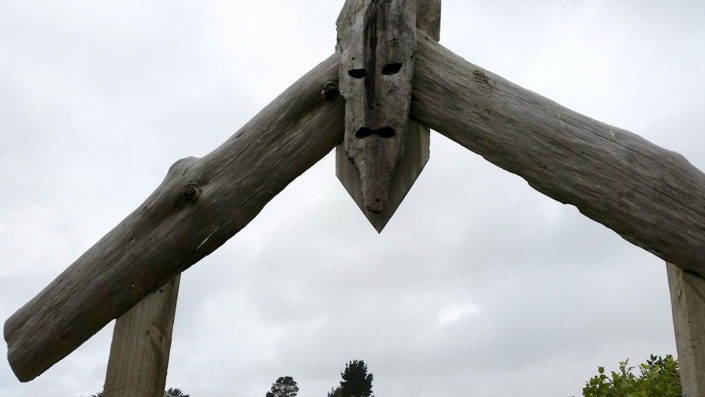 Kanohi Kitea was a project for the maara (garden) at Parihaka. Andrew Hornblow and Deon Roodt were collaborators. 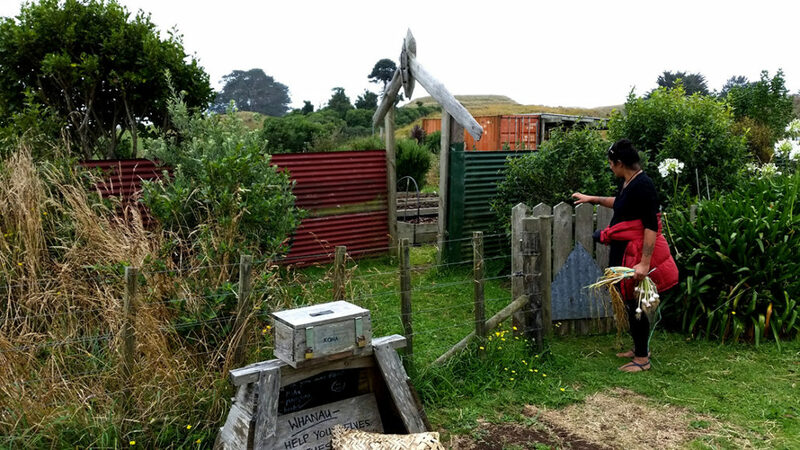 Intercreate is grateful for the support of Maata Wharehoka and Ruakere Hond. We worked closely with Charissa Warea and Howie Harris, two of the team of people who work in the community garden. Thanks to Andrew Hornblow, we were able to use the new generation of LEDs, which blinked out nutrient flow data from an old rosemary bush in the maara. On entry to and exit from the garden, audio was triggered. This was made by Darren Robert Terama Ward using traditional Maori instruments, and Dineh/Navajo flautist Andrew Thomas. We are grateful to the South Taranaki District Council and Creative New Zealand via the Creative Communities scheme for the support of the project. It has led to a second project which is in development. This is the entrance to the maara. The original gable feature was carved by Michael Marsden the youngest son of the late historian Maori Marsden. Howie Harris made the structure for the gable. It was an honour to be working at so closely with such heritage. 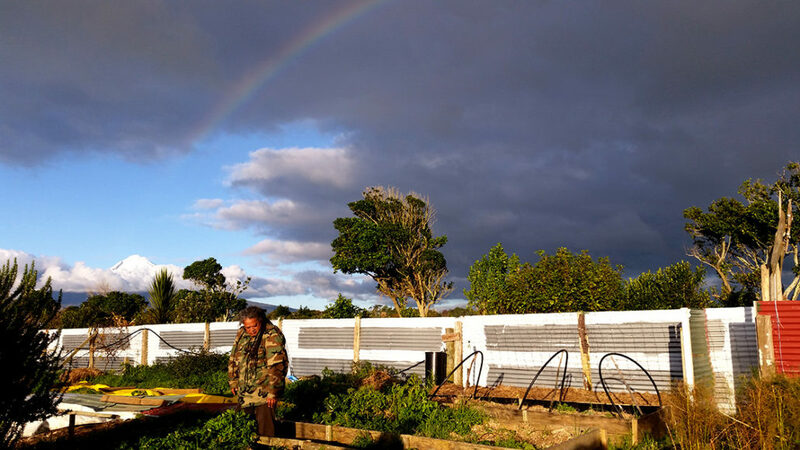 Howie Harris under a rainbow at the Parihaka maara. Howie has been around and knows quite a bit about a lot of things. It's been great to work alongside him, and chat through things. 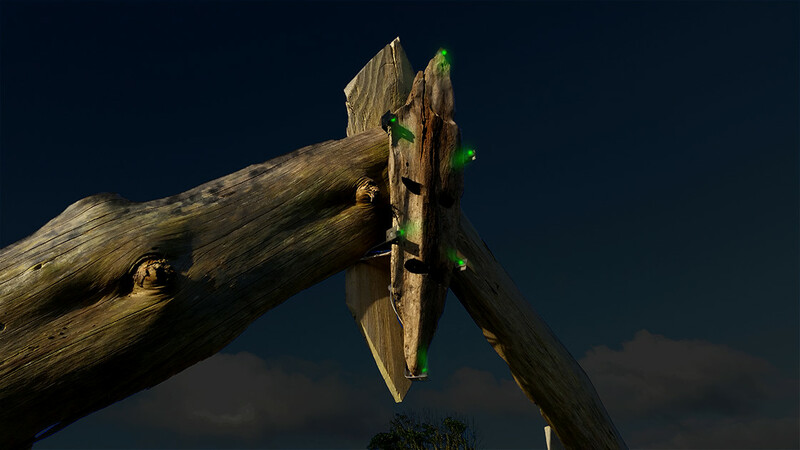 He assembled the gable, and he's one of a team of people who work in the maara. The second main gardener we worked with was Charissa Warea. Cheers Charissa. Here is what she wrote about Kanohi Kitea: "Ok I’ve been doing some investigations and the face piece that we/you are going to LED light belonged to my sister in law, Ngaahina Hohaia. It was carved by her then partner Michael Marsden the youngest son of the late historian Maori Marsden. So cool there is a connection to me. Ngaahina has advised me to proceed on this cool collaborative project with her support. Kapai. I like your concept of how you want to light the face. Think it should have a name though. So have thought of Kanohi Kitea which has a double meaning. One is a face that sees with eyes and also can mean a face that is seen often (which can be used for those who turn up to work alot are faces known). This could give meaning to the future of the maara that it cannot feed the people without being worked by faces of the community." Just great. This is a test of the lights, which we did in the container shed that the gardeners use. After the test, it was decided to have the lights more glancing on the face than directly onto it..